Back in the early 70s, living outside of San Diego, my mother collected demitasse cups and their little matching saucers. Very much like this one, from The Vintage Teacup. Although she preferred the matching pieces, she would buy separates and mix and match to her liking. She usually found them at Thrift Stores. There was a chunky three shelf wall unit where they were placed. Other than cleaning when the dust began overshadowing the motifs, they were never touched. There were her 'pretties' and strictly off limit. I do not recall the actual year, perhaps '72 or '73, but there was an earthquake. Not a monumental shaker, but enough to rattle the walls. I was reading a book on the couch and watched the painful event -- the shelf fell to the floor. Several minutes later, Mom came in wearing her white starched nurses uniform to witness me picking up the broken pieces of glass. I suggested we could glue some of them, but she said 'No' and put them in the garbage. The shelf unit was taken apart and stuck in a closet. Only two cups and one saucer remained, which were moved to her dresser. To my knowledge, she never collected more. I picked up a sewing pattern this morning to list in my shop. 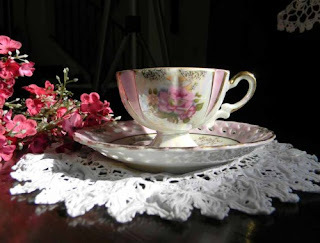 It's called My Cup of Tea by Sew Happy, and incredible enough, it is for fabric teacups and saucers. 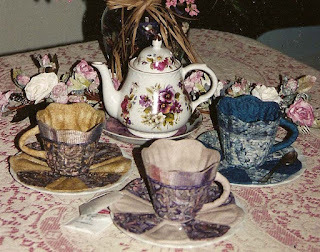 Let me say that again; FABRIC TEACUPS and SAUCERS. At first I thought it was some type of wall hanging piece, but after looking over the pattern pieces and instructions, it is quite obvious that these are the 'almost' real thing ... fabric replicas of tea cups and saucers. The actual dimensions are not stated but along the side of a small china teacup and its matching saucer. I sat here wondering why anyone would want to create sets of fabric teacups and then, I thought of Mom. If she'd had these, instead of those little demitasse cups, they would still be in existence ! Although, I don't think the demitasse has anything to worry about.